The SUP Experience is your first time hire with AVSUP. and paddle with the correct technique. you can join one of our regular group paddle sessions. 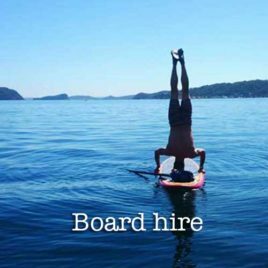 Board hire is only available after an AVSUP lesson; see Tony for details. Please confirm a date and time with Tony before making this purchase. *Includes SUP board, paddle and leash. We promise to make your party special and cater for ages 8+. We do Children's Birthday parties, Buck's/Hen's parties, Family reunions, Weddings and more. Basic party is for 8 people, for 90 minutes. All equipment and Instructor supplied. We can accommodate for additional paddles at $50 per person. Experience the joys of Twilight Stand Up Paddle with the latest SUP Lights from the USA. Choose your own colour, or go through all the colours on flashing mode. All under your control from the easily accessible operations switch located on deck. Guaranteed to light your world!